This article will show you how to use Auto Follow-Ups to double your response rate. 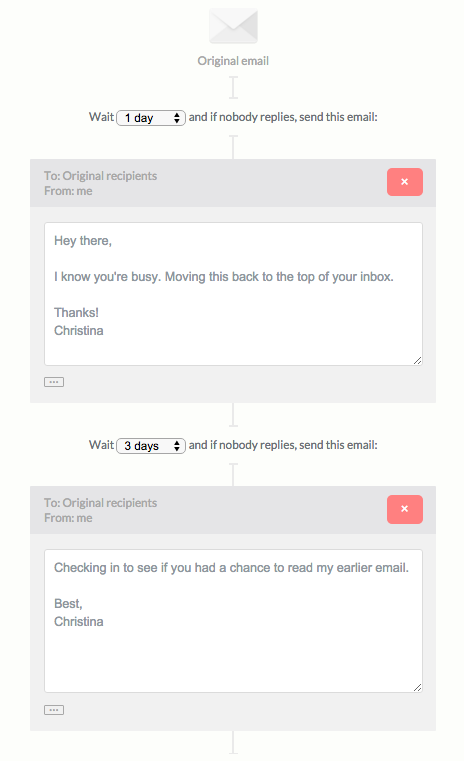 Auto Follow-Ups give you the power to send an email and then forget it. We handle all of the follow up for you with a pre-set sequence of emails that trigger when your original message doesn’t get a response after a specified amount of time. This feature is especially useful for people who want to greatly increase their response rate. When you want to Auto Follow-Up on an email, simply select “Auto Follow-Up” in your compose window. If it’s your first time selecting Auto Follow-Up, you’ll be prompted to edit your template. To edit your template at any time, simply login to your account at followup.cc and select “Auto Follow-Up” from the top navigation. We’ll pre-fill suggested copy in the messages to help you get started. You can edit not only the copy of the message, but the time frame that triggers each individual message. You can also add or delete individual stages of the Auto Follow-Up to adjust it to your ideal sequence. If you want to be notified anytime a sequence is completed, you can set that preference when editing your template as well. Can I use Auto Follow-Ups if I’m not using the Chrome Extension? No, unfortunately, this feature is available for Gmail users only. Can I use a signature in my Auto Follow-Up emails? Yes. To include your signature in your Auto Follow-Up emails, simply paste it into the bottom of the message. Note that Auto Follow-Ups do not pull in your Gmail signature.